"I reacted in the heat of the moment and it was never my intention to hit the rider," Moscon, 24, said. "As the footage shows I didn't make contact, but I regret my actions and I have already apologised to both Elie Gesbert and Team Fortuneo-Samsic for the incident." He was suspended by Sky for six weeks for a racist slur against a French rider last year. 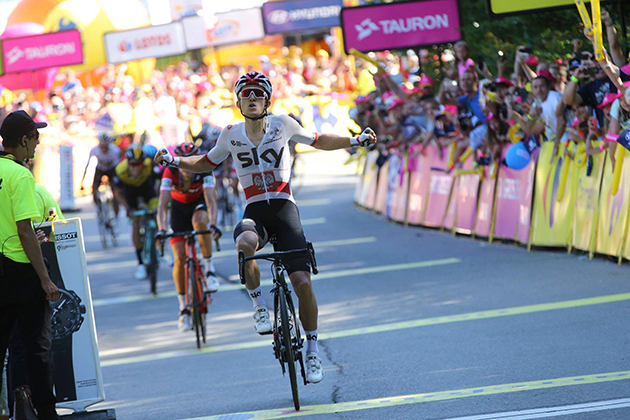 Sky won their sixth Tour de France title in seven years last month, when Geraint Thomas sealed victory ahead of Team Sunweb's Tom Dumoulin. 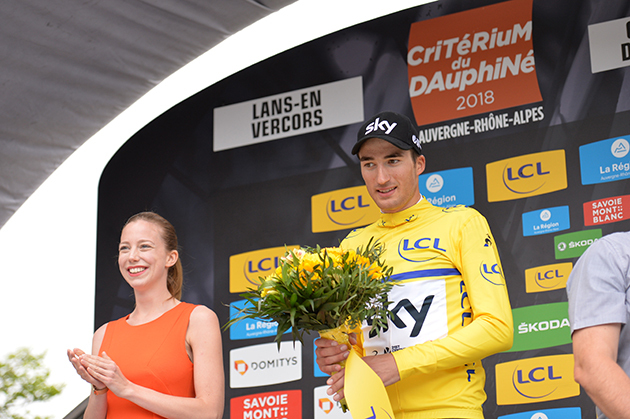 The Union Cycliste Internationale (UCI) announces that its Disciplinary Commission has rendered a decision in relation to the incident involving Mr Gianni Moscon during the fifteenth stage of the Tour de France on 22 July 2018. The UCI Commissaires’ Panel disqualified Mr Moscon from the Tour de France for his behaviour. Mr Moscon accepted his responsibility for the incident and will serve a period of suspension of 5 weeks starting from 8 August to 12 September 2018. Gianni Moscon said: “I accept the suspension given to me by the UCI. I reacted in the heat of the moment and it was never my intention to hit the rider. As the footage shows I didn’t make contact, but I regret my actions and I have already apologised to both Elie Gesbert and Team Fortuneo Samsic for the incident." Team Sky Team Principal, Sir Dave Brailsford, said: “We accept the UCI’s decision to suspend Gianni for a five-week period. We posted the report from stage winner Michal Kwiatkowski's Team Sky with the results. The fourth stage at the Tour de Pologne favoured the climbers in the bunch. BORA – hansgrohe riders Formolo and Buchmann tested their legs for the upcoming races and finished inside the top fifteen on gruelling summit finish, while Polish rider Kwiatkowski took the stage win. The Tour de Pologne hit the mountains today, and on a stage that didn’t pull any punches, it was clear riders were going to be hurting at the end of the day. The flat opening included all three intermediate sprints before the road pointed skyward not just for one, but for four first category climbs. The 179km parcours really would result in a race of two halves – but the second half was where the race had the potential to really come to life. Narrow roads at the finale and a sharp kick upwards meant the stage had a sting in its tail after an already hard day. After two incredible stage wins, the team turned its attention to their climbers. The finish line was well known from last year where Peter Sagan and Rafal Majka took second and third on this grueling final. Coming into today’s stage, the team wanted to achieve a similar result to last year, and with four great climbers in Buchmann, Kennaugh, Formolo and Konrad on paper, this squad provides an excellent chance to go for a top result on the climb with so many powerful options. A trio escaped relatively early into the 179km stage and built up an advantage of more than four minutes, while BORA – hansgrohe was riding in the main field. The breakaway worked together and passed all intermediate sprints ahead of the bunch. However, after the first climbs of the day, the break fell apart into two small groups. The climbers from BORA –hansgrohe stayed with the other main contenders in the peloton and saved energy for the tough finale. With 31km shortly before the second last climb of the day, BORA – hansgrohe rider Patrick Konrad went on attack with three other riders, but the reduced bunch caught the escapees with 13km remaining. The bunch faced the gruelling final climb as M. Kwiatkowski and D. Teuns made their move and distance themselves some metres ahead of the group. BORA - hansgrohe climber Davide Formolo and teammate Buchmann stayed at the front of the bunch, testing their legs for the upcoming races and were able to go with the pace. On the last metres Kwiatkowski took the win on the line ahead of D. Teuns. Formolo came in 10th and Buchmann in 13th position. Michal Kwiatkowski wins the Tour of Poland's fourth stage. 07 August, 2018, Szczyrk (POL): Dylan Teuns narrowly missed out on the stage win on day four at the Tour de Pologne, a stage he won in 2017, with Michal Kwiatkowski (Team Sky) passing the Belgian in the closing meters of the steep uphill finish to take the win. Strong teamwork saw Teuns well-positioned in the finale which allowed him to make a move with 200m to go and turn the last corner in the lead, but the finish line proved just a bit too far off and Kwiatkowski was able to come over the top and cross the line with a slight gap to Teuns. Earlier in the stage, three riders formed the breakaway and were able to go six minutes' clear of the peloton after 50km of the 179km stage. After the flat first half of the stage, the peloton faced four category one climbs and the steep kick up to the line, which saw Team Sky take control of the race and slowly bring the breakaway back. The steep ascents caused damage at the back of the bunch with riders dropping from the group and up ahead, Jan Tratnik (CCC Sprandi Polkowice) was the only rider left from the breakaway. Attacks came from the peloton after the second ascent of the Zamecsek, but the blistering pace in the bunch saw Tratnik and the chasers caught with 13km to go before the summit of the final categorized climb, the Lat Salmopolou. Rohan Dennis, Alessandro De Marchi, and Danilo Wyss put Teuns in the prime position in the last 10km, well protected at the front of the bunch, and De Marchi put in a good effort to cover a move from Richard Carapaz (Movistar Team) on the early slopes of the final 1km kick up to the line, which featured a maximum gradient of 15 percent. "I tried to do more or less the same today as I did last year and it didn't work out. I think second is still a good place but in this moment, I am disappointed. All credit to Kwiatkowski. He beat me in a two man fight so I can't say anything else." "I had to wait a little bit longer than last year and while my legs felt good, I had some strong contenders around me and then timing was really important. Kwiatkowski was still strong at the end and maybe my timing was just a little bit too late or just a little bit too early, I don't know. It's sad that I couldn't win for a second time." "Before the race started we knew Kwiatkowski would be the main guy for the GC so, I think he is still the big favourite. He has a strong team but there are still three hard days to go and anything is possible. It will be a fight until Friday. We know that Team Sky are always strong in stage races and have a strong team who can control the race well. I am not the only one who wants to win so there are other guys who will try to attack or do something so it will be a fight." American Tejay van Garderen will join the EF Pro Cycling organization in 2019, adding an accomplished climber and time trialist to the squad. "I’m looking forward to being a part of ‘America's’ team,’’ van Garderen said. “I’m certainly not a young rider anymore, but I’m still way too young to be put out to pasture. I’ve had some good results, some ups and downs, and I’m still interested in exploring the capacity of what I have to give, however that translates. Whether it’s helping a teammate or grabbing results for myself. Whether it’s grand tours or one-week stage races. I still think there’s a lot more I can offer." Van Garderen, 29, has been professional since 2008, riding for the Rabobank development team, the HTC franchise, and most recently with BMC Racing, where he spent the 2012 - 2018 seasons. Some of those new ideas will take shape over the offseason, when management and van Garderen begin to talk race calendar, goals, and general approach. “This is a new chapter. Maybe even a new book,” said EF Education First – Drapac p/b Cannondale CEO Jonathan Vaughters. 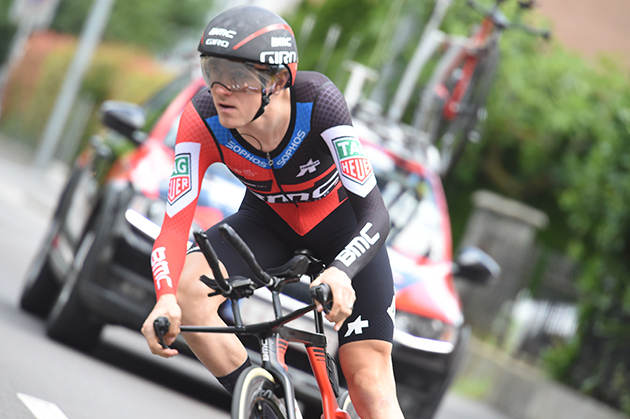 “Tejay exhibited incredible potential in his younger years. He’s been riding under very high pressure for years as he was pegged as America’s next great cyclist. That’s been tough billing to live up to, and it would have been for anyone. “It’s all part of the journey and the process. It’s super rewarding to see improvements in yourself. To be able to win a race and get up on the podium, there’s really no feeling like that,” van Garderen said. “And besides accolades — I was riding with Alex Howes the other day on the Peak to Peak and we saw a moose. That’s a small thing, but you’ve got to take time appreciate that, too. We’re out riding our bikes in these beautiful places." An open letter from Simon Gerrans regarding his future. 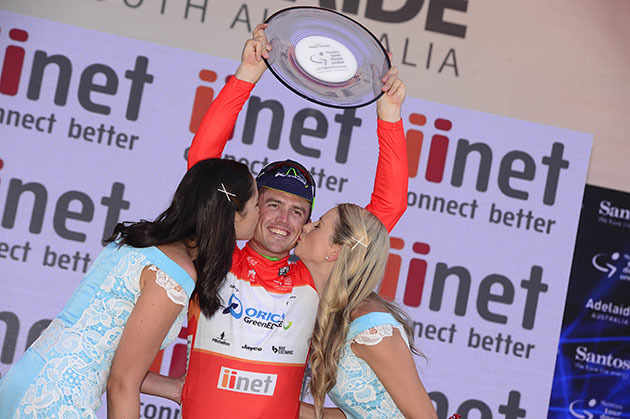 2016: Santos Tour Down Under Stage 3, Stage 4, and General Classification. 2014: Santos Tour Down Under Stage 1 and General Classification. 2006: Santos Tour Down Under Stage 2 and General Classification.